When Stuart and I were first dreaming up our LRB (you remember that stands for Little Red Barn, right?) 🙂 we used the same basic design as our greenhouse was based off of. 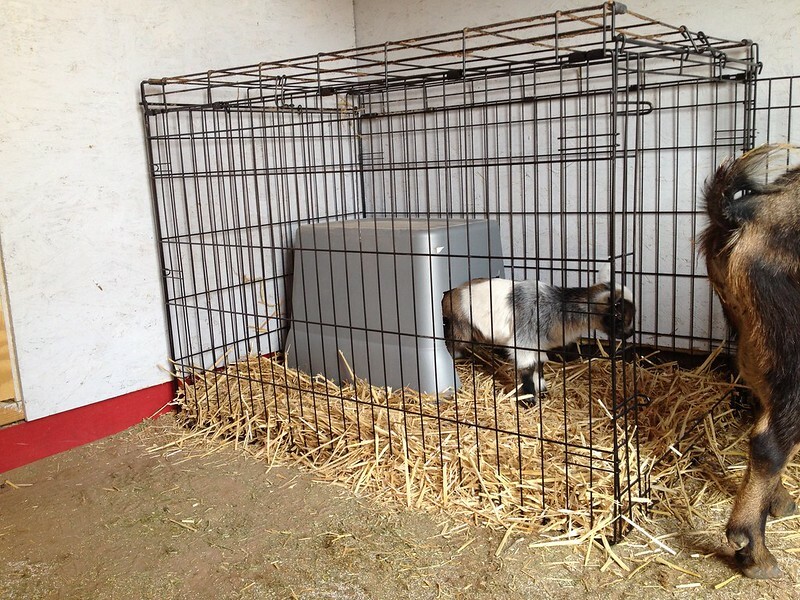 We knew it needed to be longer as we planned to use it for milking and food storage as well as goat housing. It’s interested to see how that lil ol design has morphed into this awesome structure that we now have! Measurements and numbers are not my strong point. I knew the basic floor space the LRB would have aprox 10.5 by 16′ so as I was attempting to divvy that up in my brain I had it that I could section off parts of the ‘goat side’ to have a kidding stall which would also double as a kid stall. Um… well, it is probably possible to section it off like that if we worked at it, but it would make moving around in there a really big challenge. 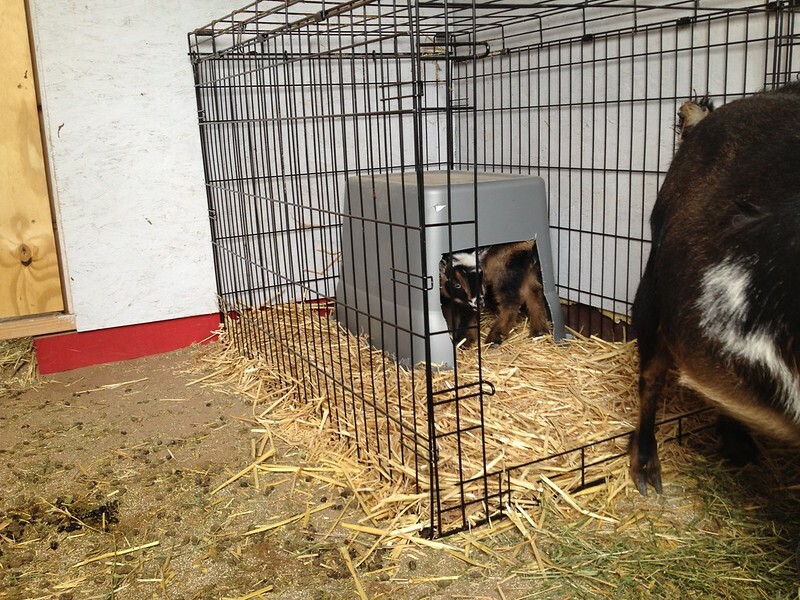 Every so often I’d think about the problem because while I knew that I wanted our baby goats to be raised by their mom, I also knew that I wanted to “share” that milk by getting to milk her once a day. The only way to do that was figure out a way to keep them apart over night. Finally inspiration struck (ouch) and I remembered the big crate that we had purchased to haul our goats home to begin with! Yay!! 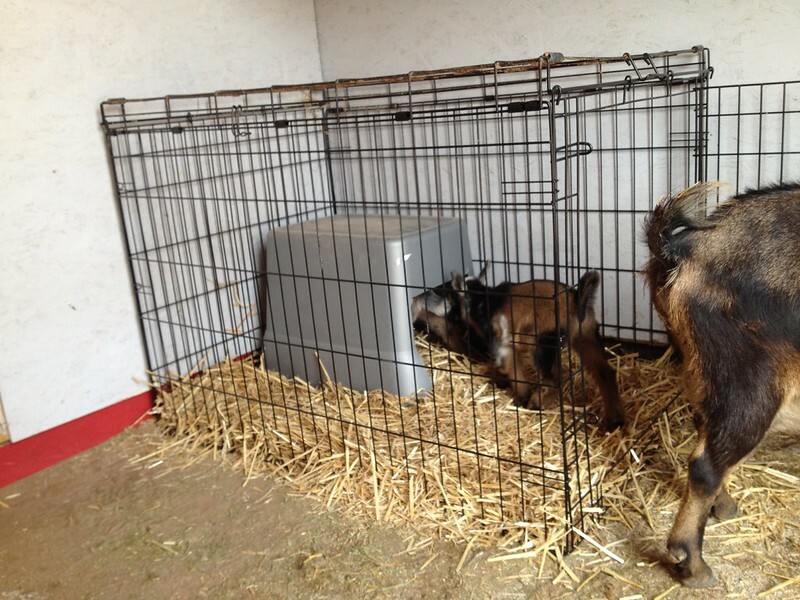 Last weekend, I mucked out the goat side, moved in the ‘kid stall’ added fresh straw AND their house, which they now love, and voila! Perfect solution with plenty of room! The goaties rushed right in to check it all out once I was finished. In a couple of days I will start to shut the babies in their “stall” at night so that in the morning I can milk Polka out full. The wee ones are already starting to nibble on the hay, and I think they’re hale and hearty so I have no concerns about them not getting enough to eat. WSR is a family owned and operated ranch in Northeastern Arizona. We care about creating systems that are healthy and humane. We don't run a large scale operation, but we do provide the healthiest food in our area. If we can't sell it to you, we can teach you how to start your own home operation.